Dignity is difficult to achieve when dispossessed people suffer under occupation and siege. JUST before receiving my “leaving permit” to travel to Seattle, I and my colleagues at the Gaza Community Mental Health Program (GCMHP) commemorated World Mental Health Day. It has now been over a year since the last offensive on the Gaza Strip, and hard memories persist. The offensive not only killed approximately 2,200 people (most of them civilians) and destroyed houses, but its fallout continues to upend futures, particularly those of our children. Each of us — our staff members, patients and their families — hold these memories. Many of us remain traumatized and in pain. Mental health is difficult to achieve and maintain in conditions like those in Gaza. The night of July 20, 2014, Israeli warplanes bombarded the three-story home belonging to my extended family in Bani Suhaila, in the Khan Younis district. The bombing occurred a few seconds after the call for the sunset prayer, which allows Muslim families to break their fast during the holy month of Ramadan. Everyone gathered around the table together to begin eating after a long day of abstaining from all food and water. In the three-story building, 18 children were sitting with their parents, in joyful anticipation of the meal to come. Seventeen children and three pregnant mothers were among the 26 people suddenly killed that night. After the massacre, bodies of some of the mothers were found in the kitchen, where they’d been finishing a couple of dishes at the last moment to keep the meal as fresh and warm as possible. Their joy that night had been mixed with intense fear of bombardment and the loud explosions nearby as the Israeli offensive stretched to its 13th day. We spent all night recovering the bodies and body parts of children. Ambulances took the bodies to the morgues in two different hospitals because of the lack of space and the number of bodies. We agonized trying to reunite the body parts taken to the wrong morgue. Today, when you walk on any street in Gaza, you are surrounded by rubble from the destruction of tens of thousands of residences. U.N. agencies report more than 18,000 residences were completely destroyed and over 40,000 damaged. In the most affected areas, children still live in trailers next to big rubble heaps that were once their homes. Last June, the minister of housing and public works, Mofeed Al-Hasayneh, announced the reconstruction of the first 1,000 units, after nearly a year of waiting. People are desperate because they feel forgotten. This was not the first offensive on Gaza. In 2003, after Olympia native Rachel Corrie was killed as she stood to block an Israeli army bulldozer from demolishing a family’s home, 2,200 homes were destroyed in that Rafah neighborhood. 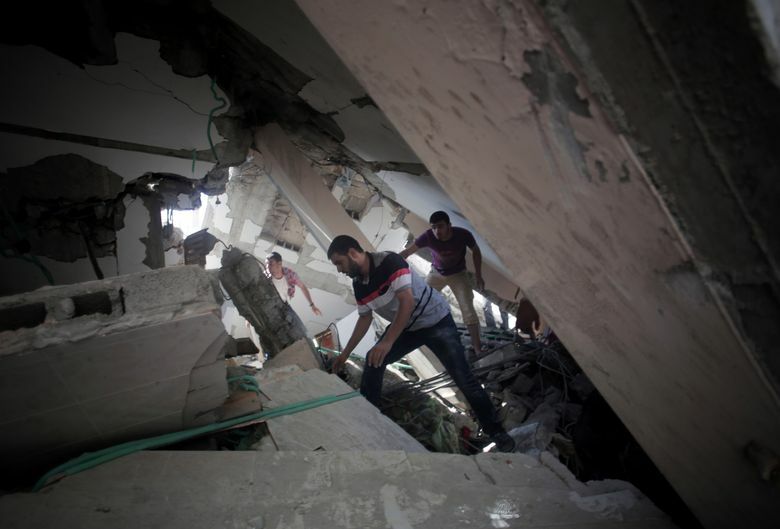 Israeli onslaughts, condemned by numerous human-rights organizations, destroyed more homes and lives in 2008 and 2009, in 2012 and last summer. The Israeli-Egyptian siege stunts our economy and prospects. No good drinking water, power available only 8 hours a day and one of the highest unemployment rates in the world have set us back and contribute to the demonstrations against our prisonlike conditions that recently led to Israeli forces shooting six people dead, including two children, at the border. Palestinian families have land just on the other side of that border that was forcibly taken from us in 1948. Hope is the key to the work that we do at the GCMHP. Among my colleagues are too many people who, like me, lost loved ones. We are determined to help one another and the wider community. The need is overwhelming. We work with displaced people, families of the killed and with the injured. We try to find elements of hope in peoples’ lives and encourage them to invest in their strengths and go on with their lives. This year, World Mental Health Day was dedicated to “dignity in mental health.” But dignity is difficult to achieve when dispossessed people suffer under occupation and siege. Oppressing people does not bring safety to the occupier. On the contrary, justice, respect for human rights, and ending the occupation is the only way to ensure peace. Yasser Abu Jamei is a psychiatrist and the executive director of Gaza Community Mental Health Program in the Gaza Strip.